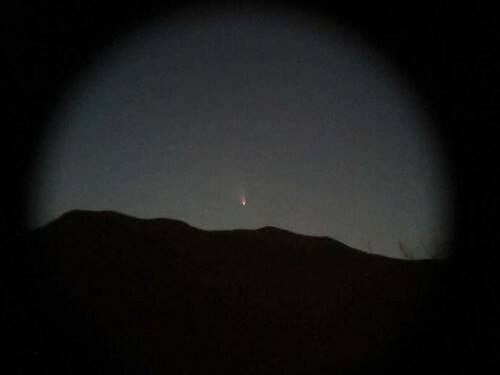 Have you had a chance to glimpse the Panstarrs Comet this past week? We have been able to see it for a few moments after sunset, for the past several nights. Last night, while waiting for Son to get off work, I got out of the car to see if I could see it. I had the photographing urge, and fished out the point and shoot from my purse, and the binoculars from the back of the car. I put the camera lens up to the binocular lens, hoping to see the comet through the camera display. I went back to the car, hoping to find some objects to stack on to the trunk, to hold the binoculars for me. My heart lept with joy to find my pinhole camera tripod! Whoopee! The next few shots were much clearer, and then Panstarrs dipped below the mountains. Bye, Panstarrs!